We gladly accept credit card orders (all major cards accepted) by phone 8am till 7pm Eastern Time (8 am till 3pm Fridays). Photographic theme: Assorted favorite images from my recent San Diego trip and the IPT. Canon 70-200mm f/4 L IS lens with the 1.4X II TC (handheld at 280mm) and the EOS 1Ds Mark III. ISO 320. Metered off the blue sky 30 degrees up from the horizon and added 2/3 stop: 1/1600 sec. at f/7.1 set manually. The 70-200 f/4 is great for travel because of its light weight, especially when it is likely that you will be photographing birds or other wildlife at close range. And the more I use the 1Ds III the more I love it. Focusing is consistently more accurate then with my main MIII body (even after the sub-mirror fix). I need to try one of my back-up MIII bodies on the 500 and give it a good test. 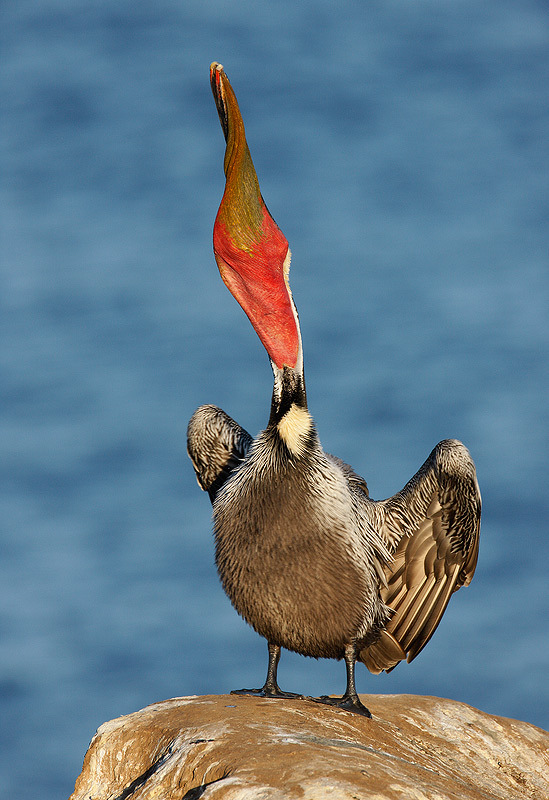 The California race of Brown Pelican is stunning in breeding plumage with the brightly colored bill pouch, especially the red at the base. Seeing that the sign did not say "Area Closed," "Keep Out," or "No Trespassing," I hopped the fence and began photographing. Several others who arrived later joined me in short order. Speaking to them, I learned that the lifeguards had visited the cliffs the week before to practice rappelling and had not said a word to the dozen or so photographers who have climbed over the fence and were photographing when they arrived. I could not locate anyone who had been hassled and neither I nor anyone in the group was ever questioned or challenged. I am not, however, sure that this will always be the case. 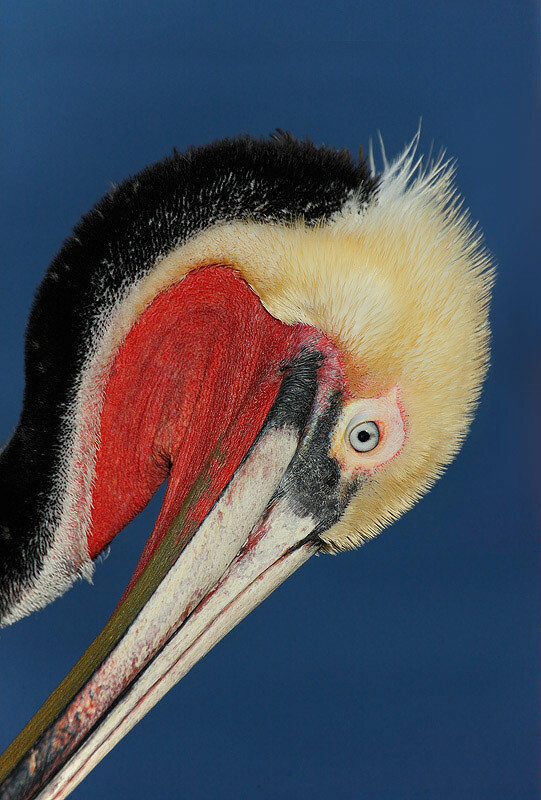 If access was denied to this spot it would be a great loss as it is the premier place in the world to photograph the California race of Brown Pelican at close range. 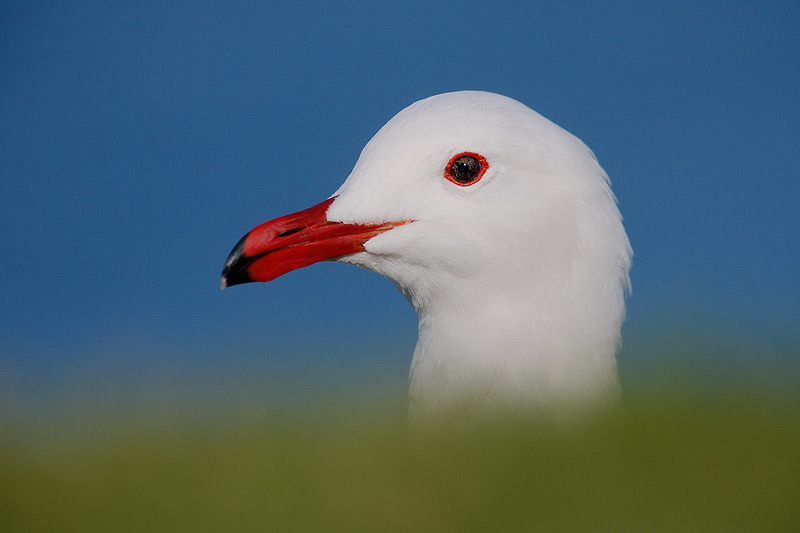 In breeding plumage, these birds feature a bright red upper bill pouch and are quite spectacular. See the important information on the cliffs below. Canon 500mm f/4 L IS lens with the 1.4X II TC and the EOS 1Ds Mark III. ISO 640. Evaluative metering +2/3 stop: 1/640 sec. at f/8. Gitzo 3530 LSV CF tripod and Mongoose M 3.5 head. 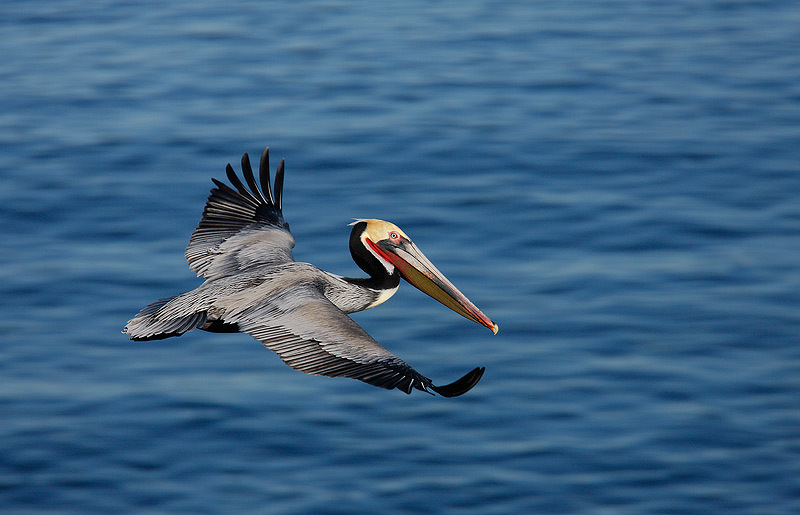 Setting the pelicans against a background of deep Pacific-blue is a sure-fire recipe for success. One thing that I have noticed about my 1Ds is that it needs more light to create a good histogram in virtually all lighting conditions than any Canon digital camera that I have ever used. Here I placed the central AF sensor on the edge of the white diamond on the bird's neck. On Saturday night (19 JAN), I met the 13 participants (the next-to-last of the large BAA IPT groups...) and presented the introductory slide program. That was followed up by a session on exposure and histograms. Then came the next day's logistics and we were off to bed. Ooops. I almost forgot to mention the gloom and doom forecast: "heavy rain and sleet with extremely cold temperatures all day on Monday and Tuesday of the IPT." Could my amazing weather luck hold in the face of a forecast like that? 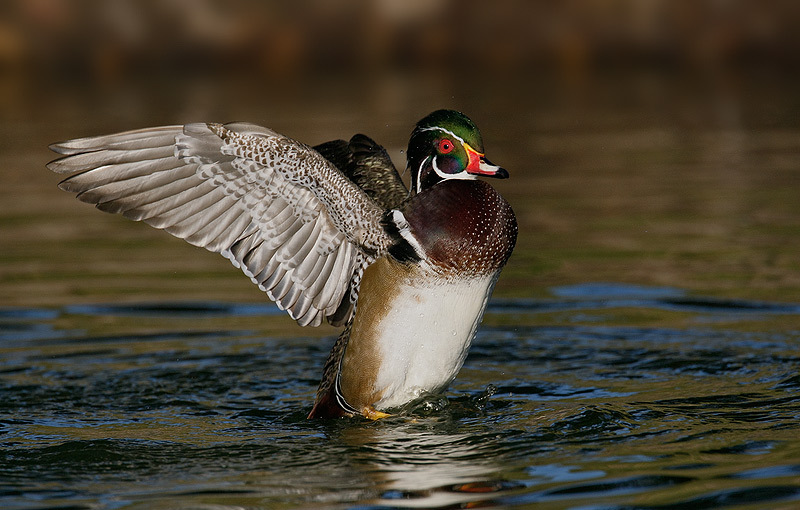 Fearing large weekend crowds at the cliffs I opted to visit my favorite San Diego Wood Duck ponds for the day. In addition to the woodies we photographed Ring-necked Duck, American Wigeon, American Coot, Mallard, White Pelican, Lewis' Woodpecker, Double-crested Cormorant, Great and Snowy Egrets, and a rather distant Red-tailed Hawk eating a coot. Pizza in the room and a great critiquing session ended the day. There were lots of great images and a great deal of learning took place. (Most folks feel that the critiquing sessions are the most valuable part of the IPTs.) Norm Dugan of BC shared some excellent images including one of a wild Mountain Lion photographed near his house. 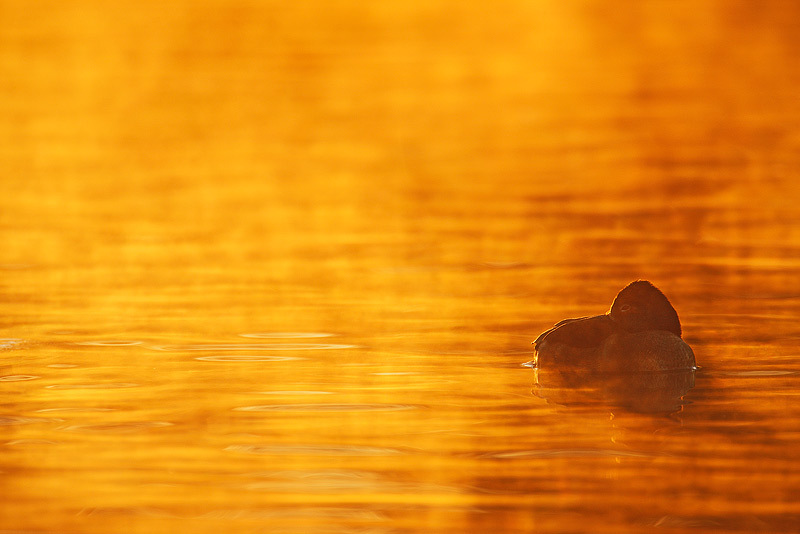 But Richard Simonsen's amazing Common Loon image was the image of the night by far. 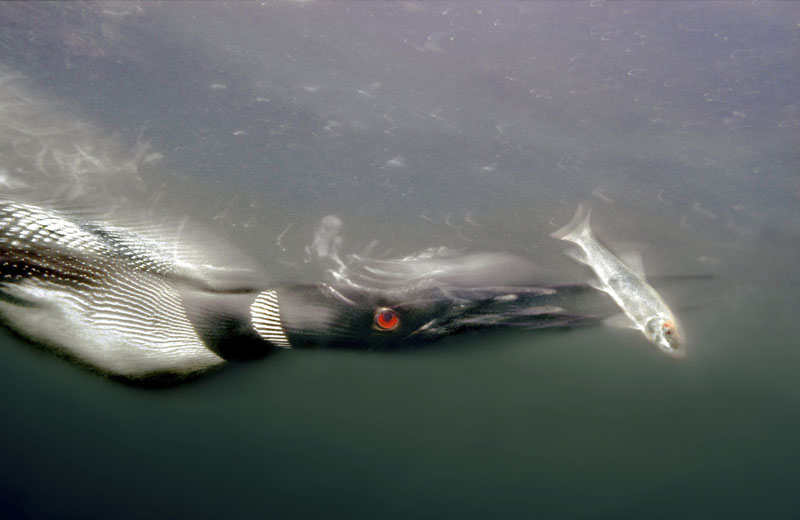 While photographing with the legendary Jim Brandenburg he held a housed camera and flash underwater, pre-focused at 18 inches, and fed fish to a Common Loon. The resulting image was truly spectacular. We visited the cliffs at LaJolla on Monday morning. It drizzled early on but the weather improved after that. With only one other photographer present we had the ideal teaching laboratory practically all to ourselves. Most folks were eager to learn fill flash techniques. With Posse members Robert O'Toole and Fabs and Alfred Forns along, there was lots of extra help for both Canon and Nikon folks. After lunch and a Photoshop session we had blue skies and west winds so we headed out to Coronado to do Lesser Scaup in Glorietta Bay and gulls in flight on the beach. We dodged another weather bullet as when we woke early on Tuesday to find that it had just stopped pouring. 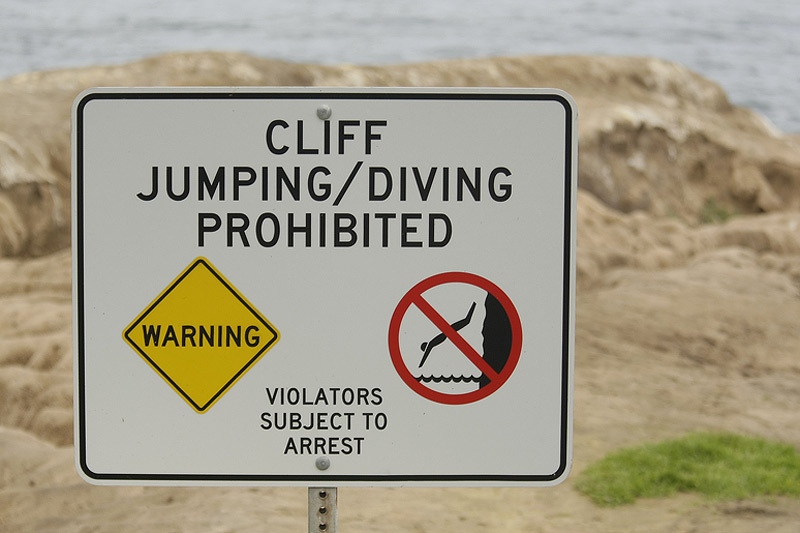 The cliffs can be dangerously slippery after a heavy rain so I decided not to visit the cliffs. 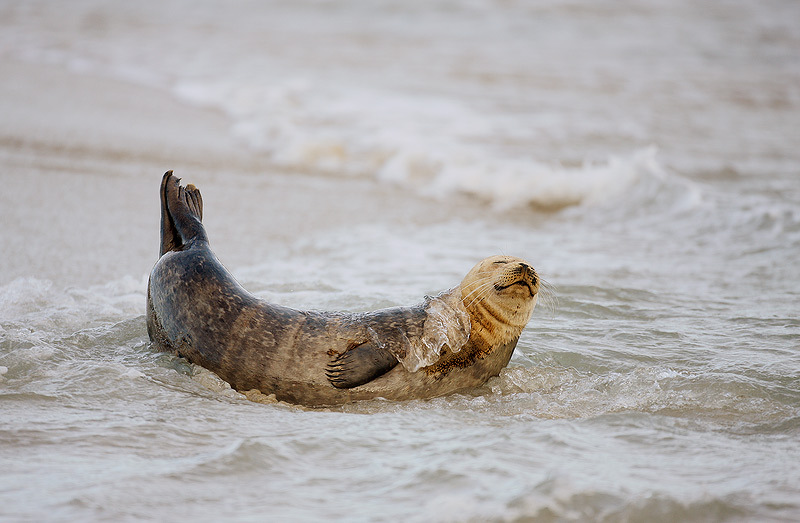 After a nice full moonrise, we made a wiggle down to the Harbor Seal location while it was still cloudy. Some Black Turnstones, a Wandering Tattler, and a lone Whimbrel added to the fun. When the sun came out a bit after nine, we headed farther south and photographed Heerman's, Ring-billed, and Western Gulls both perched and in flight. After a great Quick Masking Photoshop session conducted by Robert O'Toole that afternoon we were delighted to see clear blue skies so we headed north to one of my very favorite beaches. The expected Marbled Godwits were present and cooperative and as the sun sank towards the Pacific. An extreme low tide allowed us to work a variety of gulls both perched on rocks, swimming, and standing on the beach, all bathed in gorgeous light. The Pacific shone with backgrounds of blue and gold and the day ended with a lovely sunset. Canon 500mm f/4 L IS lens with the EOS 1D Mark III. ISO 250. Evaluative metering +1/3 stop: 1/400 sec. at f/8. Gitzo 3530 LSV CF tripod and Mongoose M 3.5 head. Here the sweet, sweet light, the gold reflections, and the patches of reflected blue sky all add to the success of the image. Our fourth and last day dawned clear and sunny with an east wind. I was thrilled that the group would finally get to enjoy the spectacular breeding plumage pelicans in early morning light. All in all it was a fantastic morning. After our third straight lunch at Rubio's famous fish taco place on Garnett in Pacific Beach , Alfred and Fabs did a wonderful Lightroom/Photoshop session. I must say that I was impressed with some of the Lightroom features that Al reviewed and Fabs wowed everyone with some amazing plug-ins. Several folks headed home as it was getting darker and more threatening outside. We split into two groups. Several folks stayed with me, reviewed images, and did some more Photoshop work while the remaining folks joined Al and Fabs who headed north and west to do some ducks-in-flight blurs. All in all the IPT was a huge success. Canon 500mm f/4 L IS lens with the 2X II TC (prone/handheld!) and the EOS 1Ds Mark III. ISO 400. Evaluative metering at zero: 1/1000 sec. at f/10. After our great last morning on the cliffs we headed south for some gulls. For some unknown reason this bird sat just below the grassy cliff-top for more than ten minutes allowing me to include the o-o-f strip of green in the composition. Handholding at 20X was not a problem due to the combination of Image Stabilization and a fast shutter speed. 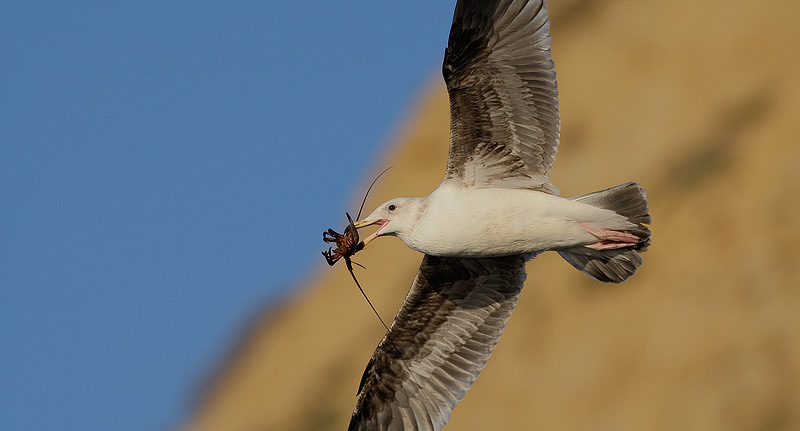 I returned to the cliffs on Saturday morning planning to let others to know that the birds were quite skittish early on, but a single photographer had arrived earlier than I and was making his way down towards a cliff covered with birds... The results were as expected. About 300 pelicans and cormorants headed for the hills. Other photographers soon arrived and with no pelicans up top they made there way to the edge of the cliff and down to the lowest level of cliffs. Their actions flushed the few remaining pelicans from the lower cliffs and prevented any birds from landing on the upper cliffs. Rather than trying to educate the masses Robert and I simply left. Lesson: If you visit the pelican cliffs in La Jolla hop the fence in the predawn and then stay well back until fifteen minutes after sunrise. I sent Robert and Alfred to the cliffs early on Wednesday to ensure that no one scared off all the birds before the group arrived. All 16 of us climbed carefully over the fence and remained just inside it, well back from the birds. With a decent sun angle, we photographed for a while after the sun cleared the horizon and then, after listening to my careful instructions, we were able to approach the birds which were totally comfortable with our presence. I advised folks with shorter lenses to make an even closer approach while on their butts and they did just that. Forewarned is forearmed. Canon 500mm f/4 L IS lens with the 2X II TC and the EOS 1Ds Mark III. ISO 400. Evaluative metering at zero: 1/400 sec. at f/8. Gitzo 3530 LSV CF tripod and Mongoose M 3.5 head. I just learned that Jeane Keane, Homer's famed "eagle lady", recently lost her small compound to a fire. Many of us have visited Jean's yard and the adjacent campground and benefited from her 25 years of hard work. 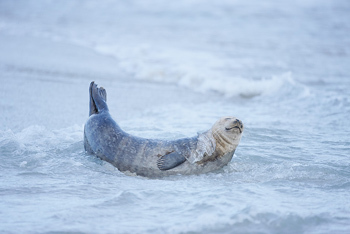 If you would like to make a donation, please send a check here: Jeane Keane PO Box 1932 Homer, AK, 99603. Canon 500mm f/4 L IS lens with the 1.4X II TC and the EOS 1D Mark III. ISO 400. Evaluative metering -1 stop: 1/2500 sec. at f/7.1. Gitzo 3530 LSV CF tripod and Mongoose M 3.5 head. In fairly bright sun with the dark, dark background I needed -1 stop of exposure compensation and even then had a few over-exposed white pixels. I selected the far shoreline with a Quick Mask and did a 15 pixel Gaussian Blur to soften the distracting details. Our new community continues to grow by leaps and bounds. There are many helpful critiques in Eager to Learn. Gus Hallgren posted a pretty fine Acorn Woodpecker here: http://birdphotographers.net/forums/showthread.php?t=2711 and received many excellent suggestions for improvement. Check out the unique and imaginative images in Out of the Box. Kenn Christensen's wonderful Canada Goose image (http://birdphotographers.net/forums/showthread.php?t=2767) is just one example of the interesting images that you will find there. There are many wonderful images in Wildlife such as Milo Burcham's wonderful ram portrait from Denali: http://birdphotographers.net/forums/showthread.php?t=2878. Also of interest is the critiquing thread that accompanies the image. BPN was fortunate to land Mike Moats as a moderator for the Macro Forum. You can see his impressive Leathery Leaves here: http://birdphotographers.net/forums/showthread.php?t=3039. And if you enjoy macro photography, you will enjoy visiting his web site: www.tinylandscapes.com. My two favorite galleries of his are Leaf Images and Nature's Abstracts. BirdPhotographers.Net/It Ain't Just Birds (www.BirdPhotographers.Net) is quickly becoming the number one educational and critiquing web site on the planet. A quick visit to any of the galleries will reveal that our philosophy of "honest critiques done gently" and leading by example are succeeding quite well. (If you are a first time visitor, you will be prompted to register. Registration is free. Folks who will be using our image hosting services or otherwise wish to support our efforts are invited to become members by clicking here: http://www.birdphotographers.net/forums/membership.aspx). Though membership is free up until April 1, 2009, more than 350 folks have already shown their support for BPN by joining as members ($20 annually). Canon 500mm f/4 L IS lens with the 2X II TC and the EOS 1D Mark III. ISO 400. Evaluative metering -1/3 stop: 1/400 sec. at f/11 set manually after histogram check. Gitzo 3530 LSV CF tripod and Mongoose M 3.5 head. I lowered the tripod and got down on one knee to soften up the background (by "moving" relatively farther from the bird. 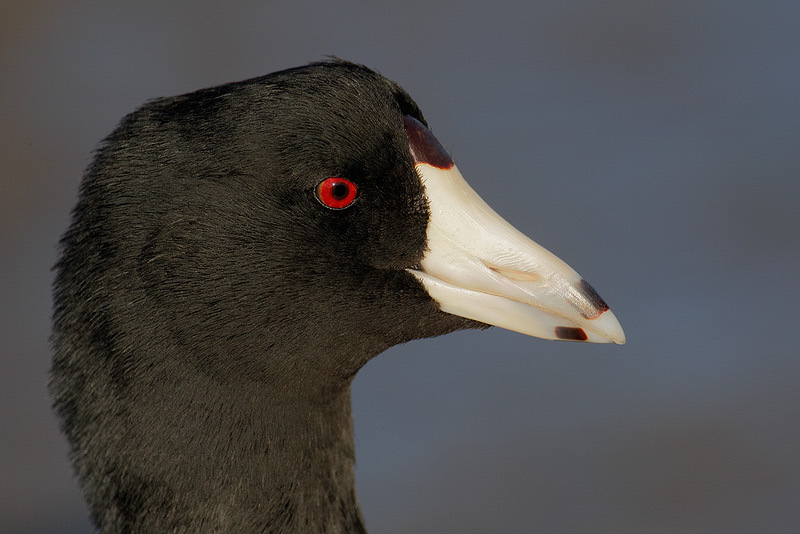 Coots are not thought to be very attractive, but by working extremely tight here their beauty is revealed. I made a color selection of the bill, put it on its own layer, and multiplied that layer to render the bill as detailed ivory. You can learn all of those techniques plus tons more in Digital Basics: http://birdsasart.com/digitalbasics.htm. Canon 500mm f/4 L IS lens with the EOS 1D Mark III. ISO 400. Evaluative metering +1 stop: 1/500 sec. at f/4 set manually. Gitzo 3530 LSV CF tripod and Mongoose M 3.5 head. As immediately above, this image had a really bad cyan/blue cast. Robert O'Toole has come up with a simple and amazing way to eliminate color casts from most images. I am pretty sure that he will be including this technique in APTATS 2. What is most amazing to me is that Robert figures out most of this stuff on his own by playing around... You gotta love it. Some folks have been having problems losing one or more of the rubber feet on their the new-style Gitzo tripods. The feet fall off as a result of the vibrations that occur during travel by air, car, or boat. A while back we passed along Robert O'Toole's suggestion that folks use some silicone rubber tips on the feet of the 6X Gitzo Series GT tripods like the very popular and best-selling 3530 LSV. Robert put the silicon caulk on all of my tripod feet but I had one fall off and disappear a few weeks later. I twisted off all of the feet and put a few drops of the non-permanent Loc-Tite on the threads and have not had a problem in four months of steady use. You might take advantage of this tip tip. Canon 500mm f/4 L IS lens with the EOS 1D Mark III. ISO 400. Evaluative metering +2/3 stop: 1/500 sec. at f/4. Gitzo 3530 LSV CF tripod and Mongoose M 3.5 head. We had some nice light on the ducks on our first afternoon but I much preferred the images that we created after the sun had sunken below the hills to the west. 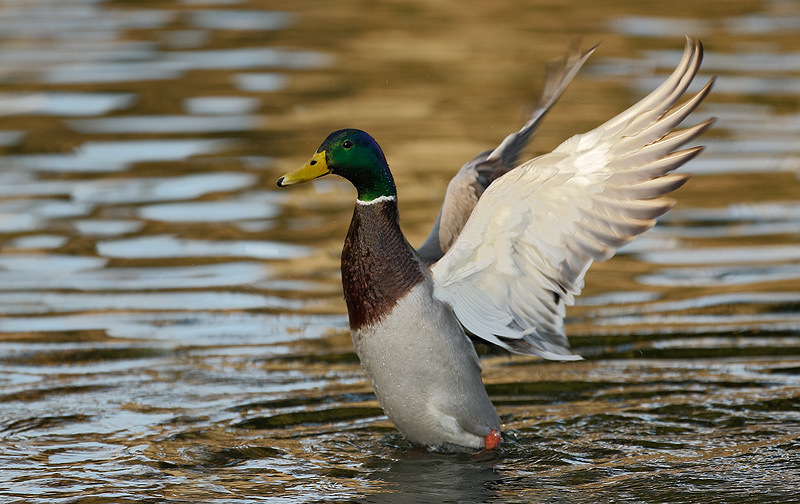 I chose the MIII over the 1Ds MIII for the flapping ducks because its faster frame rate enabled me to capture more frames of a given flap. This gave me more chances to capture a nice wing position (as I did in the image above). Canon 500mm f/4 L IS lens with the 2X II TC and the EOS 1Ds Mark III. ISO 400. Evaluative metering +1 1/3 stops: 1/320 sec. at f/8. Gitzo 3530 LSV CF tripod and Mongoose M 3.5 head. On our first morning, we had a bit of fire in the mist... With the 2X TC I was limited to the central AF sensor only. As I wanted to place the duck well out of the center of the frame I focused manually, listened for the confirmation beep, recomposed, and made the image. With me leading fewer IPTs and with reduced group sizes, the three IPTs immediately above will surely sell out far in advance. Announced less than a week ago, the three new IPTs above are already 50% sold out… If you are seriously interested in joining me in the field, it would be best to register immediately. Canon 500mm f/4 L IS lens with the EOS 1D Mark III. ISO 250. Evaluative metering +1/3 stop: 1/1000 sec. at f/8. Gitzo 3530 LSV CF tripod and Mongoose M 3.5 head. 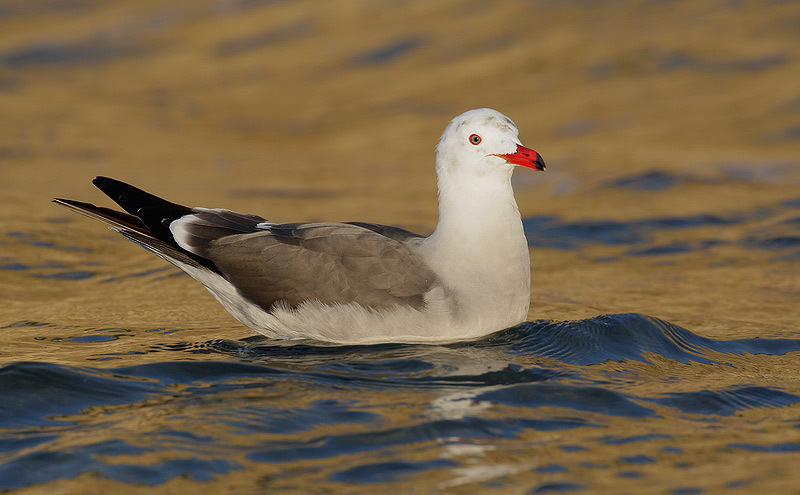 Robert O'Toole saw this bird coming and screamed out to the group so that he could be heard above the surf. (Thanks ROT!) I was using 45-Point AAFPS with the MIII. Four of the five images in the sequence were in perfect focus; the lone exception: the very best pose with the bird coming right at me and the lobster perfectly visible with the antenna spread in a perfect "V." You gotta love it.